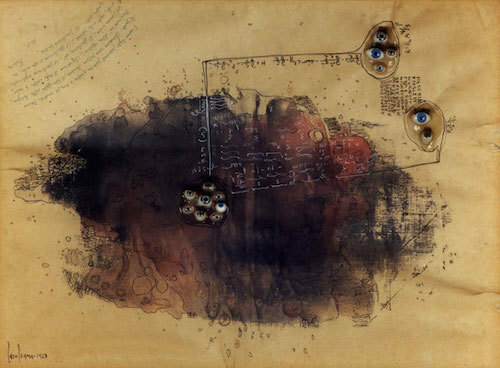 Carol Rama, C'è un altro metodo per finire (There Is Another Method to Finish), 1967, mixed media, 13 x 19''. Carol Rama’s traveling retrospective concludes in Turin, the artist’s native city, where she lived and worked. One of the most significant presences in twentieth-century Italian art, Rama was honored with the Golden Lion award at the 2003 Venice Biennale. This show, the most comprehensive exhibition of her work to date, retraces the salient moments and series of her production, with approximately two hundred works dating from 1936 until her death in 2005. Rama was self-taught as an artist, and early on, during the years of Fascism in the 1930s and 1940s, she already was addressing the thorny subject of the body, depicting, with pronounced sensuality, amputated limbs or erect tongues. A decade after participating in the MAC (Movimento Arte Concrete) during the ’50s, she adopted her characteristic bricolage technique, putting together on canvas letters and mathematical signs, porcelain dolls’ eyes and stuffed animals, as well as fingernails, metal threads, and other well-worn objects, all laden with experience. She also included other heterogeneous materials such as biological elements connected to the body, creating organisms that are both abstract and organic. In the ’70s her experimentation with materials evolved through the creation of two-dimensional assemblages, where she focused exclusively on the use of rubber from bicycle tires, a direct reference to her father’s work as a bicycle manufacturer (her childhood was marked by his suicide). In the ’80s she returned to surreal and unconventional figuration tied to the body, culminating in her notorious “La mucca pazza” (Mad Cow) series, ca. 1996–2001. This work once again conjoins identity and politics, where a contorted and post-human anatomy reconfirms the central focus of her research on the topicality of contemporary poetics that reflect on the feminine.